Shell recently delivered its first ship-to-ship bunkering of cleaner burning LNG fuel from its specialised LNG bunker vessel, Cardissa, paving the way for many other operations from the vessel. This operation marked a number of other firsts, as it fuelled the Sovcomflot vessel Gagarin Prospect, the world’s first LNG-powered Aframax tanker. 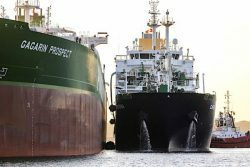 It was also the first ship-to-ship LNG bunkering to take place in the Port of Rotterdam.